Natasa Christou is a certified Architect and the director of FabLab Cy, an alternative architectural practice giving a strong emphasis in prototyping and innovation. She received her BA and Master’s degree in Architecture at the University of Westminster, London UK. Currently, she is a Phd Candidate at the University of Cyprus. She has been previously teaching at the Department of Architecture in the University of Cyprus, University of Nicosia and University of Westminster in London. Her personal direction on Computational Design became the reason to become certified as an Authorized Rhino Trainer. With more than 5 years of mentoring and entrepreneurial experience, she dedicates her work on training individuals and teams to go from idea to execution, by cultivating the entrepreneurial mindset, creative ability and tech-knowledge. 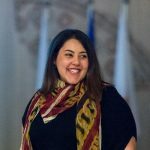 She is the founder of 3 start-ups (among which Tellalis.com, accredited with an EU innovation grant and multiple other awards). Natasa Christou has recently been appointed as a national ‘expert’ in the creative industries and cultural sector for the European Commission.